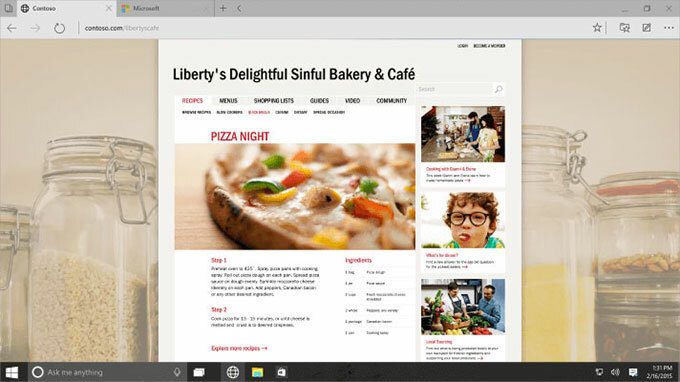 Home » Apps » Free upgrade: What’s new in Windows 10? 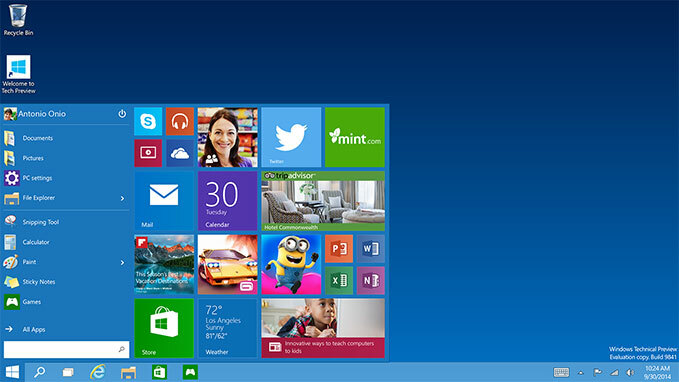 We get the Windows 10 on July 29, 2015, probably the most successful release of Microsoft. The new operating system is notable because undergone global changes: the company has taken into account all the shortcomings which have a negative impact on the popularity of Windows 8 / 8.1, optimized the code and worked user interface. In this article I will try to answer the most pressing issues related to the transition to Windows 10. Universality implies a fact that all versions of Windows-based applications are now identical, regardless of the device used, which, in turn, have a tight integration with each other. For example, a mobile version of the Action Center will be fully synchronized with the PC: the rejection of any notice on the smartphone, it disappears and the PC. Read the notice are also synchronized between all Windows-based device. For example, a message in Skype, once viewed on the PC will no longer be distracted by the tablet. Windows 10 will be a single system for all devices: desktop, laptop, smartphone, tablet, game console Xbox One , 84-inch wall-mounted screens Surface Hub or “holographic” HoloLens points. Now, a brief overview of the most important features for upcoming release. Windows 10 has undergone processing as a deeply inside and outside. “Start” menu has become flexible: it can be compact, in Windows 7, or turn on the full screen, as we have seen in Windows 8.1. When you run Windows applications take the usual form: you can move, fold, stretch and closed by clicking on the cross in the corner. Implemented support for virtual desktops, a single “control center» (Action Center) with access to the most popular functions of the system, plus the entire, voice assistant Cortana. Windows 10 boot faster than Windows 7, it also provides a broader range of drivers than the “seven”, a visual display of resources and tools to diagnose. 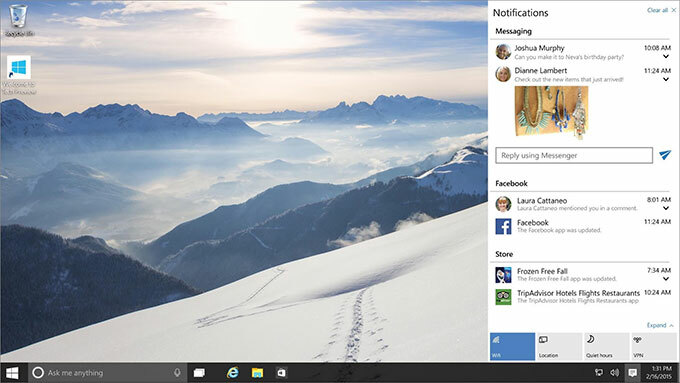 Notification Center will synchronize with all Windows 10 devices, which are under one account. In the heart of the notifications can now be displayed much more information, as well as an opportunity to fine adjust. Voice Assistant officially comes to desktop computers. Microsoft company decided to personalize Cortana, she is now able to highlight key points in the speech and some “ape.” Rather, they talk about stereotyped phrases, but its arrival on the desktop will become a huge potential base for exploring that may allow it to quickly improve in the future. As expected, the voice assistant deeply integrated into the system and the search (including local) become part of it. Functionality Microsoft Voice Assistant has something in common between Siri and Google Now, combining the most attractive features of competitors and complementing its own work. The new browser, codenamed Spartan has a new rendering engine, as well as a new interface that is inscribed in the overall design of Windows 10. The “notes” allows you to take handwritten notes, or notes on the keyboard to enter text directly on the web pages, as well as save and share received result. Thus, it is easy then read an interesting story or review where there is no internet, simply save it to your device. Besides reading mode has been added. Cortana is also integrated with the new browser, while even in the process of searching the Internet it uses the saved user data. In Windows 10 now has an application with the integration of a number of Xbox social functions, even a tape activity – sort of a tweeter, driven solely on the players in the environment of OS Microsoft. Besides the new DirectX, Microsoft has demonstrated support for streaming mode game with Xbox One other gadgets. 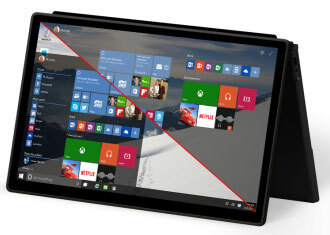 The presentation was a demonstration of the functions of the tablet Surface Pro 3, but the function is likely to Buda is also available for mobile gadgets. 84-inch touchscreen candybar with 4K resolution. It integrates cameras, microphones and other sensors and transducers. This device, which is focused solely on business users to collaborate remotely with colleagues. There is also Windows 10, but adapted for huge displays and with specialized software that will improve productivity. Microsoft has not announced the cost, but clearly this gadget will be very expensive. 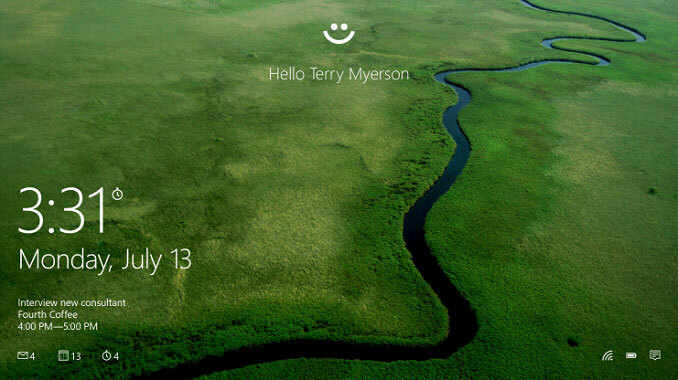 Windows 10 release is scheduled for July 29. If your copy of Windows 7 / 8.1 was produced through official channels (for example, you own a copy preinstalled on a PC or laptop), there is no need to download the “ten” release. You will be able to upgrade to 10-second versions for free for one year after release. Get Windows 10 application (by clicking on the icon on the windows task bar), choose Reserve your free upgrade («Reserve free upgrade”) and enter your e-mail address. To find out about the compatibility of current applications and devices with “dozens”, select Check your PC («Check your computer”). On the day when Windows 10 will be available for download, you will have automatic notification. If there is not Get Windows 10 icon , download the latest update through the “Update Center”. Owners of computers with Windows 7 (x64), for example, can download the update at this link (~ 750 KB). Your computer must be running the latest version of supported Windows. This could be Windows 7 Service Pack 1 (SP1) or Windows 8.1 update. Make a direct upgrade to with Vista, or an older version of OS is impossible. 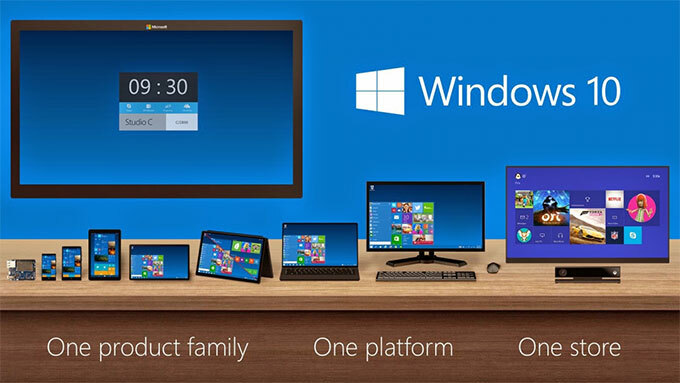 Windows 10 will be released in seven different editions. Windows 10 Home for home users, Windows 10 Pro for advanced users and small businesses, as well as Windows Mobile 10 for smartphones and compact tablets. In addition, Windows 10 Enterprise wdition with a wide range of opportunities for large corporations, Windows 10 Mobile Enterprise for business users of smartphones, Windows 10 Education for educational institutions. Finally, the seventh version of Windows 10 will IoT Core use in small footprint, low-cost devices and IoT scenarios. According to the official website of Microsoft, users upgrading from Windows 7 / 8.1, will have a similar “edition» Windows 10. For example, a PC with the “Group of Seven” (for Starter, Home Basic, Home Premium) will be installed Windows 10 Home, Professional, or to Ultimate – Windows 10 Pro. The situation with Windows 8.1 is the same. Owners of smartphones with Windows Phone 8.1 (read about them below) will have Windows 10 Mobile. Windows 10 will be free? Not so simple. While you can definitely say that if you have with a licensed copy of Windows 7, or 8.1, you get the same fully functional and activated version of Windows 10 on the July 29. Windows 10 technical preview version established for Windows Insider program participants, situation is more complicated. Last week, Microsoft blog, it was reported that all the testers “will get the final build of Windows 10 and will remain activated.” The words sounded too good to be true. They embraced, so that any user, until July 29 Download the free beta “tens” from the company website will be able to upgrade to an activated version of Windows 10 and receive updates in the future. However, a few days later edit the source in Microsoft office, removing from it the phrase “remain activated”. It was also added to “clarify” that July 29 will dispatch the free Windows 10 for owners of licensed copies of 7 / 8.1. A little later, a company spokesman Gabriel Ol even more confused situation, saying that a copy of Windows 10 testers will actually be activated – but only if they had a “clean” installation of the system (downloaded ISO-image preview version) and tied to her own Account Microsoft. What does all this mean? It is highly probable that the participants of Windows Insider, not possessing licenses for Windows 7 / 8.1, 29 of July and really get a “legal” copy of Windows 10. It will be fully functional no watermark on the desktop and it can be updated through official channels. This, by the way, and expect many “insiders”: they believe deserve Windows 10, helping to catch errors. On the other hand, the update to the preview before the final version does not automatically obtain a valid license from Microsoft. For the majority of “home” users who just need a free Windows for personal use, there is no difference. From the fact that several million people install a free copy of “tens”, not much hurt herself Microsoft. But business this trick will not work. Large companies and organizations in the event of a software audit is unlikely to be able to prove that their copy of Windows 10 – it is a “gift” from Microsoft. So corporate users will likely need to purchase a license mandatory.